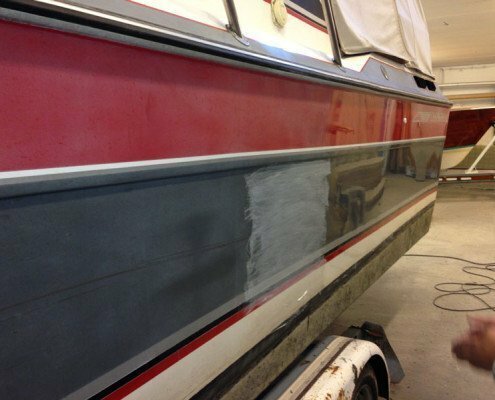 In order for your boat to keep its value and to stay seaworthy, maintenance has to be good. This is important! Everyone does not have the same skills, and maybe neither the time nor possibility of maintenance work in autumn and spring. But we do. When you store your boat for winter with us we include drydocking, wash under the waterline, cradle and launching. But we can of course also help you to mount and dismount the mast, covering the boat, winter preservation of engine and other equipment. In spring we de-preserve, polish and wax your boat. If you need to fix minor damage or replace any equipment, then the winter is a good time for this. Engine replacement is also best performed during the winter. We are authorized Yanmar dealers and service partners. However, remember to order all jobs as early as possible. Preferably in the fall. Jobs that are ordered late in the spring are difficult to accomodate. Our system with custom made boat cradles enables us to easily move the boat for work indoors in the winter. Contact us at wasa@wasayachts.com or call 08-550 972 30. It’s worth keeping the boat in good condition!